Halloween Yoga - Did You Have these Problems? 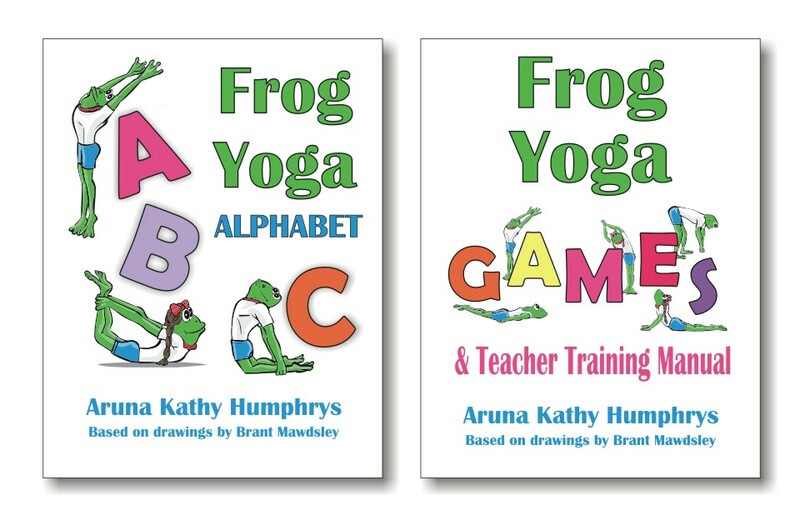 Home → Lesson Plans → Halloween – Did You Have these Kids Yoga Problems? Overheating: some costumes are full body cover ups, some even made for trick-or-treating outside in fall weather. If you’re teaching kids wearing costumes, go for simple easy poses (tree, warrior, spinal flexes) that won’t get the kids overheated. Pointy Objects: Get these out of the way before you start your yoga. I’m talking Magic Wands, Swords, Pitchforks, and even wire used in wings and capes. Some costumes make many yoga poses difficult to do – like lying on your belly or back if you’ve got a belt, skirt, tail or other extra appendages. I ended up doing mostly standing and sitting poses so the kids could participate. Candy Overload: Depending on when your class takes place, the kids may have already ingested a lot of candy, chips, and other forms of junk food. So hold off on any intense forward bending. Teach a light class that you could give someone who’s just had a meal. When I taught my classes last Friday I knew yoga was going to happen during the Halloween party. 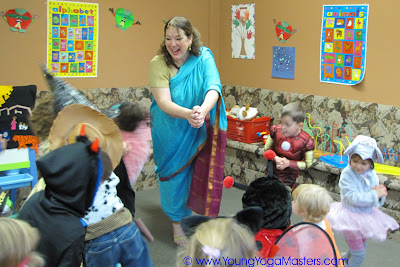 I dressed up as an Indian Princess, I’d like to know how women manage do yoga in a Sari? They are fun to wear and beautiful, but my legs get stopped in the long slip taking any big step like in the Warrior poses. With my kids yoga classes, I don’t give out candy, I give out bindi’s (stickers for their forehead or hand) which everyone wanted, both the boys and the girls. To compensate for all or our costumes, I planned for a class with one of my felt board stories. We started with an old folk tale about how to think positively and we talked about how to stay calm when you might feel a little afraid. All ages love stories and using a felt board helps everyone focus. For this class the story time increased, the yoga time was reduced, we did a daydreaming session for meditation – imagining flying through the sky, and we finished with a good round of freeze dance to keep the party feeling going. The thirty minute classes went by in no time, especially because the children were so enamored with their costumes and had a lot to say. Halloween is such an active exciting time, yoga can be a fine opportunity to relax, daydream, and find peace of mind. Does anyone else have any Halloween costume/yoga stories to share? great tips and ideas aruna. im teaching an adult halloween class…and i think the reminders and points will fit with that as well! It would be fun to do an adult Halloween class! Too bad you can’t make them dress up. I love the Bindi sticker idea for a take-away also – would love to know where you found those!